Have An Extravagant Seven Sisters Festival Experience! 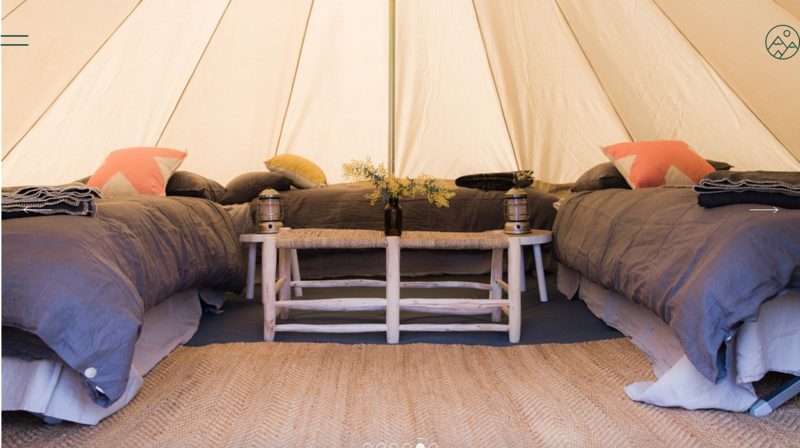 EVERY NOW & THEN IT'S GREAT TO INDULGE IN SOMETHING UNIQUE, DECADENT AND MEMORABLE– Why not enhance your Seven Sisters Experience Glamping Style? We do all the work and you simply turn up and enjoy! Don't worry about setting up tents, carrying gear, packing and unpacking...we do that all for you! 4. 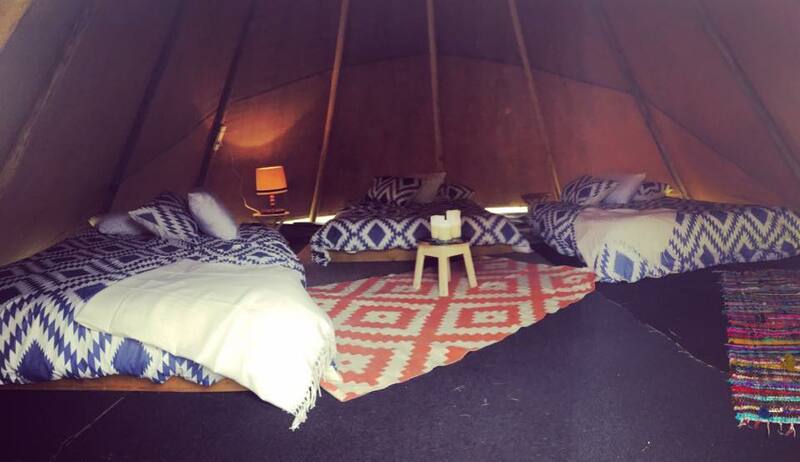 Share Tipis - Hire a mattress in a shared Tipi, make new friends and enjoy a unique camping experience. • NOTE: You must bring your own pillow & bedding. Glamp Camp's lux lounge is a private lush hang out area with tables and chairs, hot water facilities, complimentary herbal teas, refreshments and snacks for glamp guests. Meet other glampers and enjoy your own private lounge area. GLAMPING includes luxury accommodation, towel and Glamp camp lux Lounge access with free herbal tea facilities and snacks all weekend. 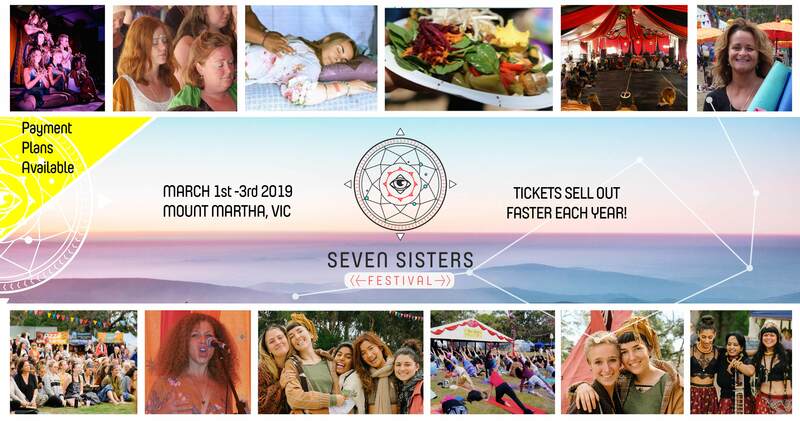 Thursday Early Bird Camp Fee of ($27.50) for entry to Seven Sisters Festival on Thursday from 4pm is payable via the Seven Sisters Festival Ticketing Site. $15 car levy (per car) please carpool, we have very limited parking space. Can pay cash on gate. Checkin is between 4.00-8.00pm on Thursday, or from 8am-5pm Friday. Please vacate your tent by 5:30pm on Sunday. Your booking is not confirmed until the full amount is received in cleared funds. Please note there are different terms for different payment methods. If you pay via payment plan and choose to cancel, all prior part payments are lost but no further payments are required. Available between May 1st & November 30th. Payments are deducted monthly on the 15th of every month, ending on January 15th. The earlier you purchase the cheaper the monthly repayments & the longer you have to pay off your ticket. If someone enrolls on Aug 8th, they will have 7 payments split evenly. The first on the day of purchase, Aug 8th, and then the 6 monthly payments left on the plan - Aug 15th onwards. YOU MUST SELECT PAYMENT PLAN AT CHECKOUT- otherwise, it will be processed at full fee. HOW MUCH ARE MONTHLY REPAYMENTS? It will be the cost of your package divided by the number of months till Jan 15th. For example. 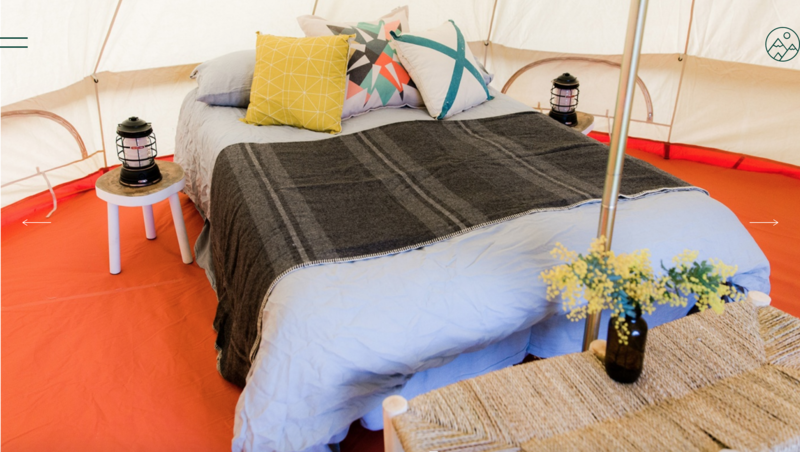 You purchase a glamp tent for 4 women for $1100 via payment plan May 17th, you divide that by 9, being the initial payment in May and then monthly payments till January, to be approximately $112 per month. Payment plan accommodation tickets & confirmation are only sent once all payments are complete. By choosing this payment plan, you agree to pay all future installments in accordance with the dates discussed. Payments cannot be taken outside of the nominated payment dates. Tickets will not be issued until the full balance has been paid. Payment plans are for the entire order and changes to your order cannot take place until the full balance has been paid. In the event that a payment has failed, the system will attempt to debit your card on the next payment date. If you would like to cancel your payment plan, the entire order will be voided and all past payments will be forfeited. For ticket related enquiries please contact Ticketbooth support@ticketbooth.com.au. The person booking, where they are booking on behalf of other people, is responsible for distributing the appropriate information that we send them, to those persons. For example, our Terms and Conditions, tent details including directions on arrival, our Information Pack within each tent, the nature of the campsite, health and safety issues, the wider woodland, the facilities, and the appropriate clothing and footwear required. Guests must be respectful to other guests on the site. Loud noise and nuisance behaviour will not be tolerated at any time and all noise must be kept to a minimum after 11pm. Guests who in our reasonable opinion are causing nuisance may be required to immediately leave the site. 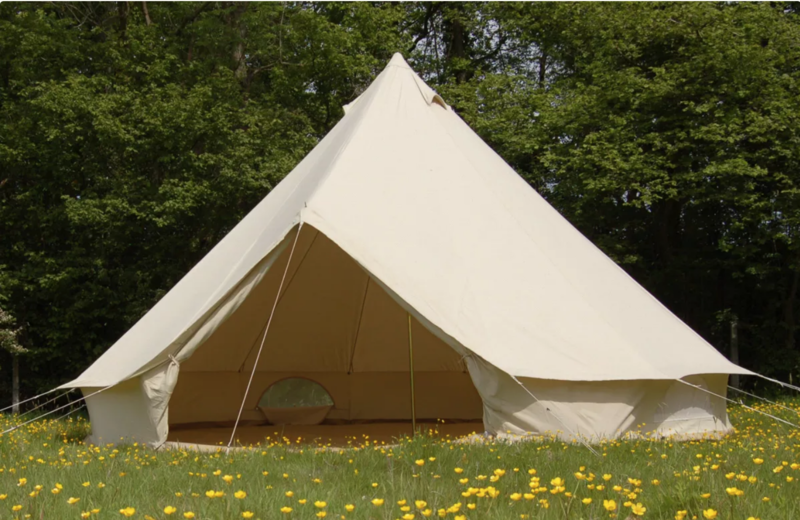 Occupancy of a tipi or bell tent must not exceed the number of people paid for in the booking. All bell tents must not exceed 4 people and we reserve the right to decline accommodation and/ or ask you to leave the site at any time if your numbers exceed this. The booking will then be deemed cancelled with full loss of payment. In certain circumstances, additional bedrolls can be arranged in a tipi but only by prior agreement and payment of an additional fee. Any damage or breakages which may occur must be paid for. Small accidental damages or breakages of a minor nature will not normally be charged but you are required to report all breakage and damage at the time, or before you leave the camp. Any complaints must be made known to us immediately. No complaints will be entertained at the end of the stay or after the guest has departed. A feedback/complaint form will be inside your welcome pack inside your tent. There is a strict NO PETS policy on the festival site. If you do bring a pet you will be asked to remove the said pet immediately. Seven Sisters Glamp Camp accepts no liability for any belongings left in the tents at any time. If you have valuable items that you wish to leave in a secure place, please let us know and we will store these for you at your own risk. Strictly NOT PERMITTED inside the tents is burning candles, naked flames, campfires or other flames and NO Smoking.